I offered these cards to my nieces who really loved it! Thanks ! Very good print quality, very well packaged and so nice to have offered a little "more"
I am very happy to have discovered this artist! This is my second purchase from Mori. I just adore all the little details in his illustrations. I especially love the expressions on the cats' faces. Every scene is so creative and super kawaii. Item was shipped next day and packaged with care. So happy he offers illustrations in post card size so I can have them all. Keep up the good work Mori! Arigato! The home second floor becomes the office. It is ”Gura” of the he-cat which sometimes comes over to the my house. This is one piece of the "TABINEKO" illustration sheet selling. Size of the paper is A3 size. Nagaoka-city is the district with much snow in Japan. -2006: establishes original design miscellaneous goods brand "SNOW-DESIGN". I handcraft a clock of the corrugated cardboard with a snowy crystal as a motif and sell it in a net shop. -2010："Guri" of the cat comes over to the house. 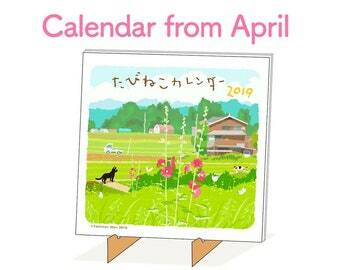 -2011: The calendar illustration of the cat with 'Guri" as a model is exhibited by a group exhibition.I produce a handmade calendar and sell a setup, the illustration which exhibited to the cause in a site called "Trip Cat'. I come to sell a calendar and a postcard, a clock of the corrugated cardboard in "iichi" "Creema" "minne" of the handmade market site of Japan. -2013: I give food in what "Gura" comes over outside a window on one day of the heavy snow and "serve". I come to sometimes come to the house from the day. -2014: It is opened a store by "Etsy". The wild cat which came over to the house increased to five of them now. I am a freelance illustrator living in Japan. I am drawing an illustration series of cats traveling, which is called "TABINEKO". The domestic cat is Tabby named "Guri". -Welcome to Cat Creation Studio "Gura Guri". -It is a shop having you surely please with the one that cats like here. Because the designer of the cat enthusiast produces it one by one heartily. Please contact only a defective article by we responsibility within three days after the arrival to the product. I pay quality goods and exchange or the price. paypal is used to the use. I send out a product as soon as I confirm the receipt of money. I ship worldwide. All orders will be shipped shipped from Japan. I send the small thing (Postcard or Calendar or A4&A3 Illustration Print) by airmail of the Small packet. This method can not be tracked. I send the A2 Illustration Print by " International e-packet". This method can be tracked. Your items Items normally shipped 2-3 business days after payment is cleard. Except during weekends and Holidays.